April 10, 2018 | 9 a.m.
Wisconsin exports a diverse array of agricultural products around the world. One high-profile item is ginseng, an herb that has been grown in parts of central Wisconsin for over a century. In 2017, the state exported more products on the whole than the previous year, which means global economic shifts like President Donald Trump's escalating trade war with China could have an even greater impact on farmers and local economies around the state. When China's government retaliated for Trump's imposition of new steel and aluminum tariffs, it struck directly at the livelihoods of ginseng growers who depend heavily on the Chinese market, where Wisconsin ginseng has a distinctive reputation. It already costs something to get that product into China, Ginseng Board of Wisconsin president Bob Kaldunski explained in an April 6, 2018 interview with Wisconsin Public Television's Here & Now. "The Chinese government does have a tariff on our ginseng coming in … it's about 15 percent currently, and there's also a 5 percent [value-added tax], and above that now we're going to get another 15 percent," he explained, laying out the overall ramifications of China's new tariff on the root, which is often used as a medicinal herb. Kaldunski said he worries about the distribution pipeline for ginseng slowing down, but isn't ready to panic. It's possible that Wisconsin ginseng's reputation as a higher-end product, for which customers generally pay a premium, could prove a vulnerability in a trade war. "We are concerned that the consumer will turn and look to a cheaper source of ginseng," he said. Ginseng's century-long history in Wisconsin has yielded a product prized for its distinctively bittersweet flavor and made Wausau an unexpected hub of the global ginseng trade. 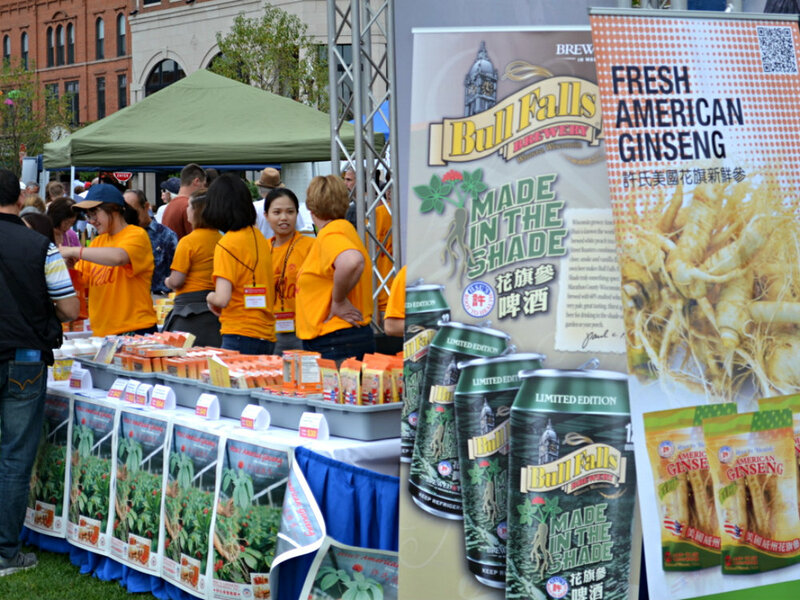 The first International Wisconsin Ginseng Festival was held in downtown Wausau in September 2017, attracting Wisconsin ginseng farmers, Chinese importers and fans from around the world. Vendors at the inaugural International Wisconsin Ginseng Festival, held in downtown Wausau on Sept. 16, 2017, sell a variety of products made with the root. The root has been prominent in another high-profile international commerce issue in Wisconsin. As Taiwan-based electronics manufacturer Foxconn locked in a multi-billion dollar subsidy for its planned LCD screen factory in Wisconsin, CEO Terry Gou also courted the state's ginseng growers with talk of new distribution channels and developing value-added products. Growers responded enthusiastically, with Kaldunski telling Here & Now in a Aug. 4, 2017 interviewthat the Ginseng Board of Wisconsin was hopeful about this prospect. Circumstances have shifted over ensuing months. In his conversation with Here & Now in 2018, Kaldunski acknowledged that, for all that Wisconsin ginseng growers rely on exports, their overall presence on the global market is small compared to other products China is targeting. Among them are soybeans, one of the biggest cash crops in the United States. Relatively speaking, the $20 million export market for Wisconsin-grown ginseng doesn't wield a lot of influence on the world stage, though it's economically crucial to communities in the central part of the state. It's tough to predict the overall impact the Chinese tariffs will have. Ginseng grown in Wisconsin doesn't go to market until November or December. Given the volatile Trump administration, and with unpredictable midterm elections coming up, a lot could change in 7 months.